Which one of these diesel sedans is the most is the most comfortable and practical sedan for your family? Let’s find out. The ever competitive sub 4-metre sedan category gets a new entrant in the form of the all-new Maruti Suzuki Dzire. With it, Maruti has fired a fresh salvo in a segment that also consists of cars like the Hyundai Xcent (recently facelifted), Tata Tigor (all-new), Volkswagen Ameo (a Polo with a boot) and the oldest car in this comparison, the Ford Aspire (a Figo with a boot). The Maruti Suzuki Dzire has a cohesiveness in design that is not seen in any of the competition, barring the Tigor. Highlights include the LED headlamps, LED DRLs (which are super bright), flowing body lines, and taut rear. Chrome details on the bumper and the grille are odd, but not deal breakers. The Hyundai Xcent has been given a facelift to keep it fresh, but did it actually need it? The pre-facelift Xcent was not a bad looking car and you couldn't be offended by it, which is not the case with this one. The LED DRLs look like an aftermarket job, and the front fascia as a whole looks a bit forced and awkward. It is understandable that Hyundai wanted to make the Xcent look different from the Grand i10, but the face makes us yearn for the older and simpler design. The other standout car in this comparison is the Tata Tigor. While the face is similar to the Tiago, the rest of the car is completely different and well put together. The notchback ('Styleback' in Tata lingo) saves the trouble of finding complex ways to integrate the boot into the design, while also freeing up luggage space. In fact, with 419 litres of boot space the Tigor has a full 12 litres more space than the nearest rival, the Hyundai Xcent! Highlights include projector headlamps, notchback design and wide high-mounted LED stop lamp (like the Audi A7/RS7). The Volkswagen Ameo is a confusing car to look at. From the front, it looks like the good old Polo - understated and mature. Move to the side and the first signs of the struggles between the designers and engineers show up. The Polo itself is 3971mm long and there was very little space to engineer a boot into, and that shows. The boot really looks like a forced afterthought in this case. The Ford Aspire is the oldest car in this comparison and that shows. That is not to say that the Aspire looks bad - from the front it has a grown up look which is only matched by the Dzire. However, the side and rear design is very bland, with elements like the 14-inch alloy wheels and slab-like boot being the main culprits. When all the cars are lined up, it is easy to perceive which ones could be more spacious on the inside. The Dzire is low and wide -- in fact, it looks like the widest amongst the cars here. The Tigor stand out because of its height. The Hyundai Xcent looks the most lopsided of all, with a rather narrow body - narrower than even the Tigor! Surprisingly, these visual cues are indicative of how spacious these cars are on the inside. You don't have to step inside the Dzire to realise that this is a spacious car. With a width of 1735mm, the Dzire is a whole 40mm wider than the nearest rival (the Ford Aspire). The relatively small central tunnel, flat seatback and seat base make it easier for the third passenger to sit at the back, and it has one of the most comfortable rear seats in the business. A massive leap ahead from its predecessor. The Dzire's cabin feel the most spacious of the lot. The use of light coloured fabric on the seats and door-pad armrests also make the cabin feel premium, although they could become dirty easily. There are some bits that lower the fancy quotient though: the windshield wiper control does not get intermittent speed control, which is available on the Ameo and the Aspire; and the switchgear on the doors are from the Maruti parts bin and do not suit the otherwise good quality interiors of the Dzire. The Hyundai Xcent has one of the more eye-pleasing interior designs of all the cars in this comparison. Along with the Dzire, it has one of the better infotainment systems in the group in terms of usability and smartphone compatibility, but the sound quality from the 6-speaker system is average. Based on one of the oldest platforms in this comparison, the Xcent suffers in terms of interior space. With a cabin width of 1330mm at the rear, it is very difficult to fit three average-sized adults abreast. The saving grace is that there is a lot of knee room and headroom for the passengers, which makes the cabin feel pretty usable for four. The look of the materials used inside the Tata Tigor makes it feel like it is from a segment below. However, the interior design and features offered make up for the average quality of the interiors. The highlight on the centre console is the 5-inch touchscreen infotainment system developed in conjunction with Harman; while the system is rather small and a bit laggy, the 8-speaker music system has terrific sound output. In spite of being the shortest car in this comparison, Tata engineers have magically been able to scoop out an unbelievable amount of space inside for passengers as well as their luggage. If there is one gripe, it is that the middle passenger in the rear bench won’t be very comfortable as the central transmission tunnel is large and the cushions of the seat are raised in the centre. As a four-seater, the Tata Tigor is very nearly the best, especially for taller occupants. The Ameo is the most cramped car in this comparison, and that is a sad fact considering how well built its interiors are. The black-and-beige interior is the most tastefully laid out in this comparison, but it can be accused of being a bit too familiar and boring. The biggest gripe for the driver will be the aftermarket-fitment like centre armrest; it is not very comfortable to rest your hand on while cruising and also hinders quick gearshifts even when folded up. For rear seat passengers the combination of low kneeroom, headroom and width make the Ameo the least comfortable car to be in, especially three abreast. This is a pity considering the Ameo's seats actually feel the most comfortable and ergonomically well designed among these cars. The Aspire uses a lot of beige upholstery which makes the interior feel even more spacious, and it is also the only car here to get leather seat covers. But the built-to-a-cost image shows through in many ways: the plastics are hard and tacky, there are hardly any gadgets on board, the rear doors do not have any storage space and the rear centre armrest does not get any cup holders. What it does offer is good usable space for five passengers, though it is not as comfortable in doing so as the Dzire. While it may not have the longest list of features, the Dzire certainly has the latest. In the top-of-the-line 'Z' variants, the Dzire is fitted with segment-first LED projector headlamps with auto on/off, very bright LED DRLs, a 7-inch touchscreen infotainment system that supports both Android Auto and Apple CarPlay, automatic climate control, a start/stop button and rear A/C vents. Safety features such as dual front airbags, ABS, EBD, Brake Assist, ISOFIX child seat anchor points are offered as standard across the range, which is a welcome addition. The Dzire doesn't get rain-sensing wipers, intermittent wiper speed settings, telescopically adjustable steering wheel and height-adjustable front seatbelts, which shouldn't have been given a miss given how costly the car is and how Maruti wants this car to feel premium. The Hyundai Xcent feels premium even before you enter the car; the ORVMs swing out/in automatically when you lock/unlock the car. Step inside and the large infotainment system catches your attention; among all the touchscreen units on the cars in this comparison, it is the Xcent's system that is most responsive and easiest to use – though it doesn't have the same display quality as the Dzire's unit. The Xcent also gets comfort-enhancing features like rear A/C vents and a rear centre armrest. It is also the only other car in this comparison to feature a start/stop button. Some features do make the interiors less premium; the headrest-integrated front seats feel cheap and also make the cabin a bit claustrophobic for the rear passengers, the IRVM is not auto-dimming like the pre-facelift model (though none of the other cars here have that feature). For a car that is Rs 2.05 lakh cheaper than the most expensive car in this comparison (the Maruti Suzuki Dzire) and also Rs 1.07 lakh cheaper than the next most expensive car (the Ford Aspire), the Tata Tigor is very well specced. It is the only other car in this comparison to feature projector headlamps apart from the Maruti Suzuki Dzire. The infotainment system consists of a 5-inch touchscreen display paired to an 8-speaker surround system developed by Harman, the best in this comparison. Though it is not Android Auto or Apple CarPlay compatible, Tata has its own app that can be used to access many built-in features in the system including satellite navigation. The Tigor misses out on features like rear A/C vents, height adjustable front seatbelts, steering-mounted phone controls but these are not deal-breakers considering how affordable the car is. The Volkswagen Ameo has the most expansive feature list in this comparison. Along with segment-standard features, it also features cornering lamps, rain-sensing wipers, cruise control, one-touch up-down power windows on all doors, foldable rear bench and tilt-and-telescopic adjustable steering wheel, all adding to the practicality of the car. Step into the Aspire and you feel the age of the car, especially because of the company it is in. There is no touchscreen infotainment system, rear A/C vents, dead pedal for the driver, automatic lights/wipers etc. While the Ford has unique safety features such as six airbags and MyKey, it misses out on features like a reversing camera or even reverse parking sensors! The Aspire is in desperate need of an update as it currently lags behind the others in terms of features. The Maruti Suzuki Dzire is powered by a 1.3-litre, 4-cylinder turbocharged motor paired to a 5-speed manual transmission. It develops 75PS of maximum power and 190Nm of peak torque. City – 19.05kmpl. Highway – 28.09kmpl. Combined – 21.31kmpl. ARAI-certified – 28.4kmpl. The Hyundai Xcent is powered by a 1.2-litre, 3-cylinder turbocharged motor paired to a 5-speed manual transmission. It develops 75PS of maximum power and 190Nm of peak torque. The Tata Tigor is powered by a 1.05-litre, 3-cylinder turbocharged motor paired to a 5-speed manual transmission. It develops 70PS of maximum power and 140Nm of peak torque. City -17.43kmpl. Highway – 24.31kmpl. Combined – 19.151kmpl. ARAI-certified – 24.7kmpl. The Ford Aspire is powered by a 1.5-litre, 4-cylinder turbocharged motor paired to a 5-speed manual transmission. It develops 100PS of maximum power and 215Nm of peak torque. City – 16.49kmpl. Highway – 23.85kmpl. Combined – 18.33kmpl. ARAI-certified – 25.83kmpl. The Volkswagen Ameo is powered by a 1.5-litre, 4-cylinder turbocharged motor paired to a 5-speed manual transmission. It develops 110PS of maximum power and 250Nm of peak torque. City – 17.02kmpl. Highway – 20.65kmpl. Combined – 17.93kmpl. ARAI-certified – 21.73kmpl. When it comes to performance, the Ameo and the Aspire come into their own. The Ameo has the most powerful engine here which is paired to one of the slickest transmissions in this comparison. But it is not the quickest car in this comparison. That distinction belongs to the Ford Aspire. In spite of being down on power and torque, the Aspire does the 0-100kmph run in 10.75 seconds, almost a second faster than the Ameo. We did our performance runs in the rain, and the tyres on the Aspire were not in the best condition – it makes you wonder if the Aspire is even faster in the dry and by how much! Changing your pace, even without changing gears, is snappy in these two. So if you are planning on doing a lot of highway stints these two cars should be looked at closely. However, there is one criticism: the VW feels a bit noisy. The Maruti Suzuki Dzire is the fastest of the smaller-displacement cars in this comparison, in spite of being not so powerful. Its low kerb weight of 990kg is the reason for this combination of good performance and great fuel-efficiency. The Hyundai Xcent follows next: while it isn’t the most eager when pushed hard, it is still a very usable engine on the highway. The Tata Tigor comes dead last in our performance tests. The combination of a weak engine and heavy kerb weight make the Tigor suffer both in terms of performance and efficiency. In the city, the Xcent and the Dzire lead the way in ease of driving and comfort. The Xcent is easily the nicest to drive in the city. This is down to the smooth and quiet engine which is also very peppy at low revs. An easy to use gearbox and a light clutch make it the easiest car to drive around in the city. Thankfully the Dzire’s engine doesn’t feel as coarse as before, and while the power also flows smoother there is still a noticeable rush in performance around 2,000rpm. Yes, the Dzire isn’t very peppy but a light clutch and superb gear changes and make it a surprisingly enjoyable car to cruise around calmly in. The Ford Aspire will add some excitement to your commute. Despite its somewhat springy clutch, this would be the next best bet, as it can tackle city traffic without too many gear changes. Against the clock, the VW is the quickest in terms of in-gear acceleration, but in the real world, the sudden rush of torque make it a bit harder to drive in the city. The Tata Tigor again disappoints as all it seems to want to do is cruise, even an overtake in the city has it protesting loudly. When you drive all cars together even the slight differences become apparent and this was important when it came to evaluating the suspension setup. If you spend most of your driving time on highways, the Volkswagen Ameo and Ford Aspire should rank high up on your list. Both the cars have great high-speed stability, the Ameo more so because of its stiffer suspension setup while the Aspire gets a bit bouncy. Both cars have responsive steerings, though the Aspire's unit weighs up/lightens better with speed. But when you look at comfort at lower speeds the tables turn as the stiffer Ameo transmits all of it into the cabin while the Aspire seems to glide over them. The Dzire feels steady at highway speeds but lacks feel from the steering. The Xcent would is also fairly capable on the highway but it doesn’t feel as grounded as the Maruti. But when you get into city mode the Xcent scores big time. Despite the suspension being a bit soft the Hyundai surprises by tackling really bad roads without getting bouncy. It actually controls up and down movement well, but when you hit a sudden dip or pothole it tends to crash into them. Like the others, the Maruti’s setup isn’t perfect, but it brings a specialness to the mix. The Dzire tackles broken roads very well, and only here and there do you feel some stiffness. The highlight though is how quietly the Dzire’s suspension works, which makes the rough surfaces seem that much further away from the occupants. The Tata Tigor has a comfortable ride in the city and the underpowered diesel motor delivers power very calmly. Its suspension also takes bumps well but gets caught out by sharp side-to-side movements. It is impressive how good the Tata Tigor is, especially considering the fact that it is the most affordable car in this comparison by a margin of just over Rs 2 lakh! It is one of the better-looking cars in here, has a lot of premium equipment and is roomy enough to haul a family of four in comfort. The reason why the Tigor trails every other car here in spite of the aforementioned factors is its lacklustre engine. If Tata had plonked in the larger 1.2-litre diesel from the Zest, the results would have quite different. 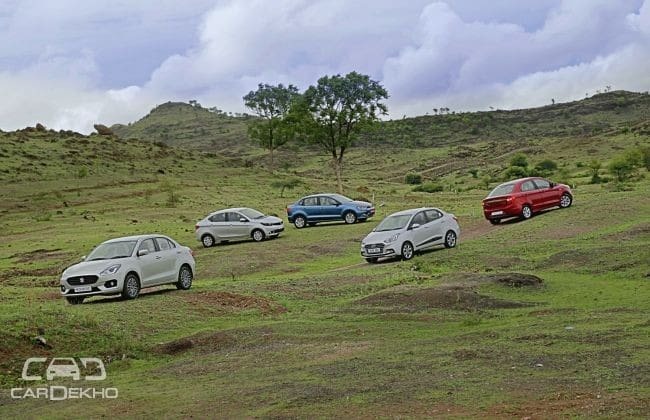 It is difficult not to like the Ameo -- it has the best build quality of all the cars in this comparison, one the more responsive engines, a sporty ride, impeccable highway cruising abilities and some standout features. But as a family sedan, it falls short on many grounds - it is not particularly good to look at, rear seat space is the smallest here and the ride is not comfortable over anything but the smoothest of roads. The oldest car in this comparison is not high up the list either. The competition has moved on and left the Aspire behind. The good news is, it wins back brownie points because of its powerful and usable engine, a very spacious cabin and its focus on safety. The Xcent loses out to the Dzire only because of one major flaw - its inability to seat three abreast comfortably at the rear. Otherwise, it is genuinely an all-around performer; it has a refined and frugal engine, has a long list of features and is comfortable over varied road surfaces. The winner though is the Maruti Suzuki Dzire. The Dzire isn’t the best in terms of performance or features, it could do with fewer rattles from the plastic and it is the most expensive car here. But, the sense of space, class-leading fuel efficiency, genuine everyday usability and all of which is topped off with a sense of sophistication make it an incredible all rounder. In fact, the Dzire feels less like a sub-4 metre and a lot more like a full-size sedan.